The top Libyan rebel military commander in Tripoli, Abdel Hakim Belhaj, dropped something of a bombshell in an interview with the New York Times yesterday: In 2004, he said, two CIA agents tortured him in Thailand and then "rendered" him to Libya. From that point on, he maintains, he was held in solitary confinement for the next six years. "Yes, [Belhaj] said, he was detained by Malaysian officials in 2004 on arrival at the Kuala Lumpur airport, where he was subjected to extraordinary rendition on behalf of the United States, and sent to Thailand," the New York Times' Rod Norland writes. "In Bangkok, Mr. Belhaj said, he was tortured for a few days by two people he said were CIA agents, and then, worse, they repatriated him to Libya, where he was thrown into solitary confinement for six years." 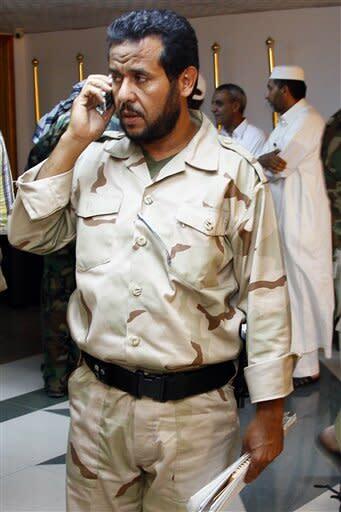 Now, Belhaj heads the Libyan rebels' military committee for restoring order in the capital of Tripoli. A spokeswoman for the CIA told The Envoy Thursday the agency declined to comment on Belhaj's allegations. But the allegations point to the challenge facing Western diplomatic officials in Libya: How much does the West know about the influential faction of the Libyan rebels with past Islamist jihadi ties? And how will such ties affect the effort to safeguard U.S. interests in a post-Gadhafi Libya? The scholar Omar Ashour summed up the dilemma in an article this week informed by his interview with Belhaj last year: "Does his prominent role mean that jihadists are set to exploit the fall of Qadhafi's regime?" Belhaj, known as "Abu Abdullah al-Sadiq" in jihadi circles, is the previous commander of the Libyan Islamic Fighting Group (LIFG), "a jihad organization with historical links to al Qaeda, the Taliban, and the Egyptian al-Jihad organization," Ashour, an academic at the University of Exeter and Brookings Doha Center, explained in an article at Foreign Policy this week. The paramilitary Libyan Islamic Fighting Group, established in 1990, "led a three-year, low-level insurgency ... in eastern Libya and tried three times to assassinate Qadhafi in 1995 and 1996," Ashour wrote. After Gadhafi mostly crushed the group in 1998, "most of its leaders and members fled and joined forces with the Taliban in Afghanistan," where they pledged loyalty to Taliban leader Mullah Omar. Following the Sept. 11 terrorist attacks and subsequent U.S. invasion of Afghanistan, "Belhaj and most of the LIFG leaders fled that country as well, only to be arrested in 2004 by the CIA and then handed over to Qadhafi's regime, following interrogations in Thailand and Hong Kong," writes Ashour. Belhaj was then imprisoned in Libya for six years in brutal conditions. Following his release in 2010, he participated in several "reconciliation" conferences between the Gadhafi regime and anti-Gadhafi Islamist militants, spearheaded by Gadhafi's son and onetime heir apparent Seif al-Islam. Ashour attended those panels as an observer. Last week, Belhaj led the rebels' seizure of Gadhafi's Tripoli compound. But as Belhaj exulted that "the tyrant fled," he also "repeatedly called for enhancing security, protecting property, ending vendettas, and building a new Libya," Ashour observed. In his interview with the Times yesterday, Belhaj stressed that despite his group's past ties with the Taliban, it is now entirely focused on liberating Libya from Gadhafi's control, and is no longer advancing the cause of global jihad. "We focused on Libya and Libya only," Belhaj told the Times. "Our goal was to help our people. We didn't participate in or support any action outside of Libya. We never had any link with Al Qaeda, and that could never be. We had a different agenda; global fighting was not our goal." As for his six-year confinement and Libya and the CIA rendition preceding it, Belhaj told his Times interviewers that he's not looking to exact revenge. "Definitely it was very hard, very difficult," Belhaj told the Times, but added, "Now we are in Libya, and we want to look forward to a peaceful future. I do not want revenge." Still, he added, he wouldn't mind seeing his interrogators face legal proceedings: "If one day there is a legal way, I would like to see my torturers brought to court." UPDATE: More documents revealing CIA and MI6 cooperation with the Libyan intelligence service emerged with the search of former Libyan intelligence chief Moussa Koussa's Tripoli office by reporters and a Human Rights Watch researcher. See this article from the Wall Street Journal's Siobhan Gorman: "Tripoli files show CIA working with Libya," and this from the New York Times, "Files note close CIA ties to Gadhafi intelligence unit."